Melt Pressure Gauges are rapidly becoming the preferred choice of cost conscious Plastics Processors and Extrusion Machinery Builders throughout the globe. Extrusion Melt Pressure Gauges from Skylark provide years of reliable, maintenance-free, localized pressure indication, at prices substantially below the competitors. Extrusion Melt Pressure Gauges require no electrical power and are totally maintenance free. Extrusion Melt Pressure Gauges feature all stainless steel construction. The large 4 inch gauge head can be rotated 300º for pressure reading convenience. Skylark, the global leader in price/performance, quality, and delivery. 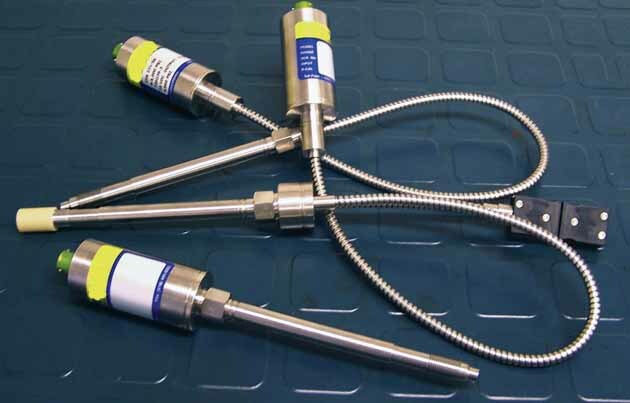 Melt Pressure Transducers offer high accuracy, repeatability, industry standard functionality, at prices substantially below the competitors. Extruder Rupture Disks are designed for reliable emergency relief of excess pressure since they instantaneously rupture at a specific predetermined pressure range. Skylark's model CBP Extruder Rupture Disk is designed specifically for use in plastic extruders. Each assembly consists of a stainless steel body and rupture disk. A rupture disk may be specified for primary relief in applications where pressure buildup can occur so rapidly that the response time of a relief valve is inadequate, such as in a polymerization reaction vessel. Extruder Rupture Disks (Burst Plugs) From Skylark are designed exclusively for use on Plastics Extruders.